Upon impact, a device called an event data recorder will send information to the local 9-1-1 call center. Dispatchers will be able to determine not only the accident’s location, but also its severity, how many people were in the car and what sort of medical help they are likely to need. As with “black box” recorders in aircraft, event data recorders in vehicles capture and store data just before and during an accident. “The data includes information about how fast the car was going, the change in velocity during the crash — which gives you a sense of the force of the impact — where the car was struck and direction of the impact, how many people were in the car at the time it crashed, whether they were wearing seat belts or not, and if the car rolled over -- and if the car rolled over, how many times,” said Dr. Eileen Bulger, chief of trauma surgery at Harborview Medical Center and UW professor of surgery. Bulger has a special interest in improving the care of trauma patients before they reach the hospital. She and colleagues at the Harborview Injury Prevention and Research Center have worked for years with the National Highway Traffic Safety Administration to investigate crashes of cars, light trucks and vans. The Harborview team reconstructs crashes, documents injuries sustained by the occupants, and follows their treatment and recovery. About two years ago, they began their study on how crash notifications could be better incorporated into medical response. Trauma specialist Dr. Eileen Bulger with a patient at Harborview Medical Center. She and her colleagues at Harborview’s Injury Prevention and Research Center have worked for years with the National Highway Traffic Safety Administration. Currently, information from event data recorders is transmitted to subscription commercial services, such as GM’s OnStar, whose operators can relay information to the local 9-1-1 center. But precious minutes tick by and the risk of miscommunication is high. Ergo the efforts to have data recorders transmit directly to 9-1-1. The original 9-1-1 systems were based on analog technology developed in the 1960s, said Marlys R. Davis, King County program manager. Today 70 percent of calls come from cell phones, she said. Such handheld devices can transmit text, photos and video that old 9-1-1 systems can’t handle. The ongoing upgrade of the 9-1-1 system would enable interaction with data recorders and cellphones, and address cellphones’ inability to transmit their exact locale, as land lines do. Even cellphones with GPS applications do not give the address where the call is originating from, which can make it difficult for emergency responders. 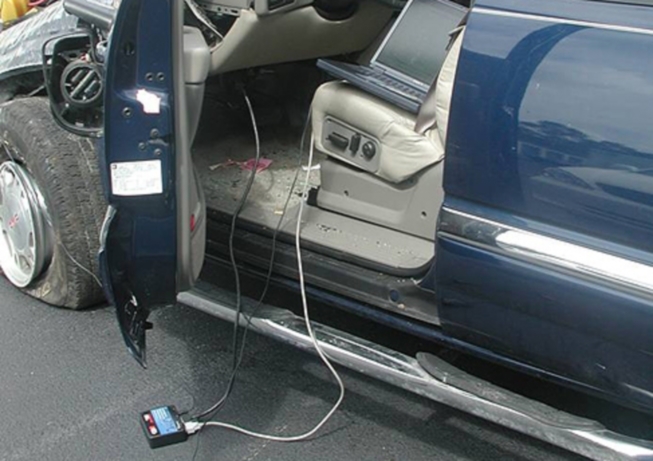 Ultimately, when this system is integrated with information coming from the event data recorder in your car, “Emergency room and trauma doctors will know the likelihood they will be dealing with severe injuries even before people have been pulled out of the car,” Bulger said. One challenge of developing this system is to demonstrate that the information reliably predicts the injury severity. At the scene, accident victims can often appear not to be injured but may have internal injuries that are life-threatening. In responding to a car accident, there are two important points in the decision tree, Bulger said. “The first is what resources you send to the scene. The second is at the scene, where you have to decide whether to take the patient to a trauma center or a local hospital. “It appears the black box data can provide a great deal of information at both points,” she said.